What power could Volnethian Artifacts Hold? The galaxy has long forgotten the Volnethian Sovereignty, a planet-spanning empire which lasted for centuries before being mostly eradicated by the collapse of their homeworld. The remnants of the Volnethian people now live on the wrecked remains of the two moons, orbiting the husk of their planet. The secrets of the Volnethian Guardians are lost in time, but their power resurfaces in ways which continue to impact the galaxy. 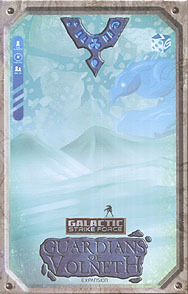 Guardians of Volneth expands Galactic Strike Force with new sectors, additional missions, new station cards, and Volnethian Artifact tokens.